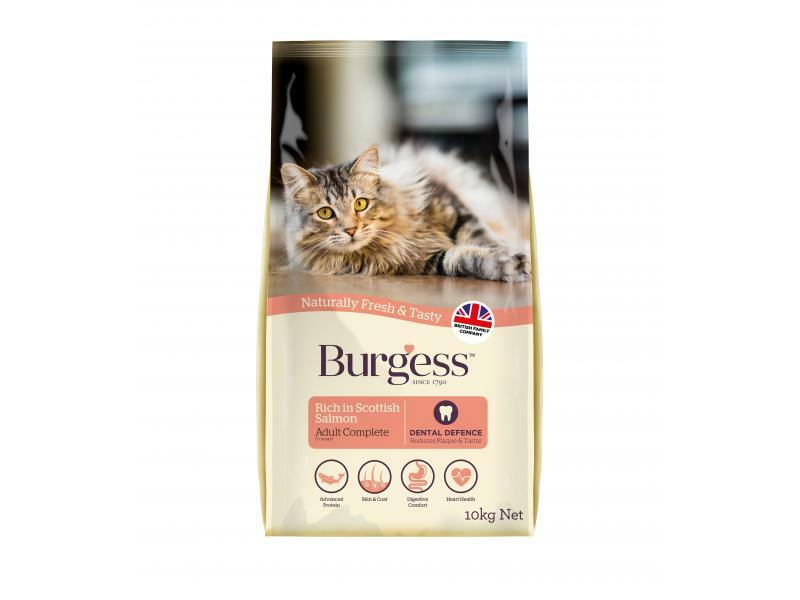 Burgess Adult Scottish Salmon is a complete dry food for adult cats. It contains fish oils to promote healthy skin and a glossy coat, Taurine and Vitamin A for bright eyes, and has no added colours. Antioxidant vitamins are present to help control the effects of ageing and help support the immune system. The kibbles have been coated with STAYClean which helps to reduce plaque and tartar on the cat's teeth. It has been specially formulated to be a supatasty meal each and every time. Maize, Salmon (min 14%), Wheat, Rice, Maize Gluten, Chicken Meal, Poultry Fat, Fish Meal, Beet Pulp, Yeast, Chicken Liver Digest, Minerals, Stay - C50 700mg/kg. The table below can be used as a guide to the daily requirements for adult cats. This guide is aimed at maintaining adult average weight and condition and is based on a moderately active cat. Individual needs vary and feeding should be adjusted as appropriate to maintain your cats optimum weight and condition. Cats like to eat lots of small meals so a bowl of Supa Cat is perfect for letting them eat when they please. There are currently no questions for Burgess Scottish Salmon Adult Cat Food - be the first to ask one!